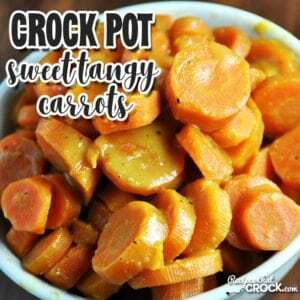 Crock Pot Sweet Tangy Carrots - Recipes That Crock! Are you looking for a great side to go with a special meal or maybe a side that will take a weeknight up a notch or two? Then I have a treat for you! 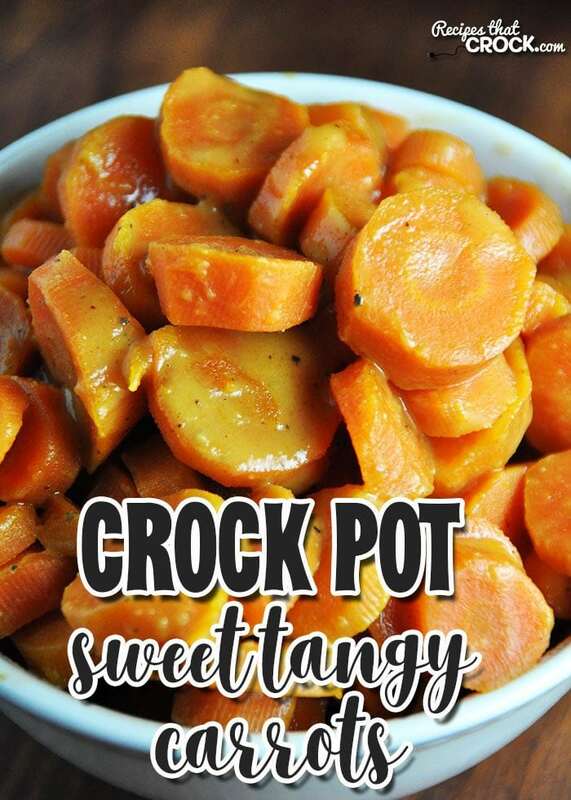 These Crock Pot Sweet Tangy Carrots have a surprisingly unique and delicious flavor! Note: We use referral links for products we love! Now if you know me, you might be thinking, “Lou doesn’t eat carrots!” While that is true, my family loves them. 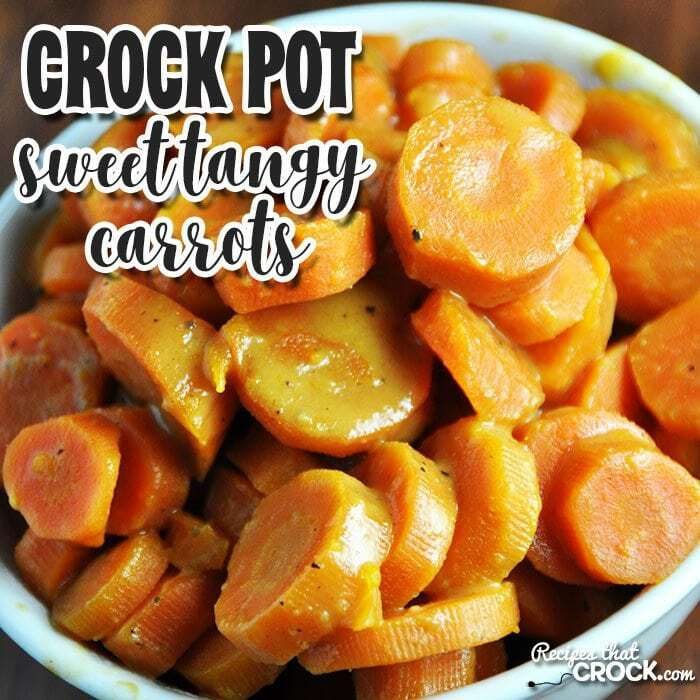 So when I saw this recipe for Crock Pot Sweet Tangy Carrots in Gooseberry Patch’s 101 Super-Easy Slow-Cooker Recipes, I thought I would be a good wife/mommy and make them up for them! Make sure you use high and not low…unless you need the recipe to take longer. I was sick, but had already bought the ingredients to make this recipe, so Michael put them on for me. Unfortunately, dear hubs read the directions wrong and put it on low instead of high, so I can attest that this recipe will work on high or low….low is just going to take longer. These Crock Pot Sweet and Tangy Carrots are a great way to convince your kiddos to eat their veggies too. The sweet and tangy together is the perfect combo to entice anyone to try their carrots. This recipe is SO special that I went out and bought a new crock pot. I shall call him Mr. Mini. Mr. Mini is a 4-quart Crock Pot and did a great job with these Crock Pot Sweet Tangy Carrots. Try something new with your carrots, you won't regret it! Yum! How many pounds of carrots, chopped will give the 10-12 serving? I had a typo in the recipe (one too many words! oops!). It is fixed now. You’ll need 12 carrots. Enjoy! Could I substitute baby carrots for the sliced ones? Yes, you can use baby carrots. Be sure and watch it closely the first time you make it and adjust your cooking time to work with the baby carrots. Enjoy! I haven’t ever canned carrots before, so I don’t know if these could be canned or not. If you give it a try, let me know how it turns out! Enjoy! These look delicious. Pinning now to make later. Also I loved the song Doubting Thomas. I hope you love them as much as my family does! I completely agree! Doubting Thomas is one of my favorite songs!